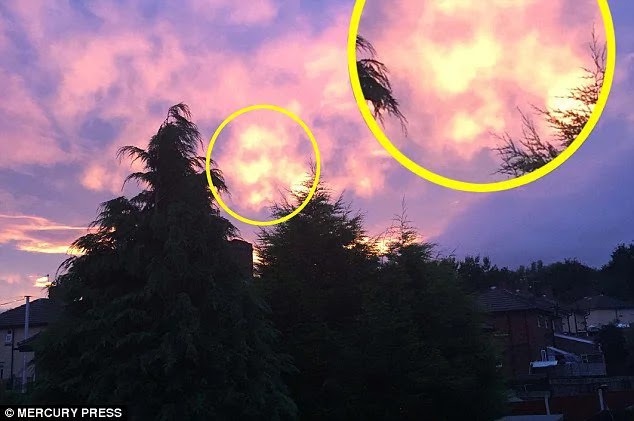 A 26-year-old mother-of-two couldn’t believe her eyes when snapped the shot, looked at her smartphone and saw the mystery bearded face staring back at her! The blurry silhouette resembling Jesus’ face can be seen in the middle of the image of the striking pink and purple skyline in between the two trees. Recalling the moment Becky said: “I was just taking a nice picture in my son’s bedroom of the sunset because I thought it looked really pretty. I couldn’t believe it when I saw the face looking back at me through the camera it was so cool. She sent the picture to her mother who was also amazed by the resemblance and the pair both posted it on social media. Expectedly, it immediately went viral forcing people in different corners of the world guess who is that guy with kind face hiding in heaven. Although there were various theories about and comaprisons to popular actors and siners, Becky is convinced — Jesus revealed himself to her. Something this weird happened in Nigeria as hundreds of people gathered at Saint Augustine’s Catholic Church which is located in the Nenger area of Makurdi in Benue following the appearance of an image of Jesus. Pareidolia is a psychological phenomenon involving an image or a sound wherein the mind perceives a familiar pattern of something where none actually exists. Common examples are perceived images of animals, faces, or objects in cloud formations and hidden messages within recorded music played in reverse or at higher- or lower-than-normal speeds.